The 13th Annual Meeting of GEoPD (13-14 December 2018), is hosted by GEoPD French partners: Alexis Brice, Alexis Elbaz, Jean-Christophe Corvol, and Suzanne Lesage. GEoPD is a global consortium of researchers dedicated to promoting education, scientific research and translational development in PD. The consortium founded in 2003 by Michael J Fox Foundation has been operating since 2004, and has an active membership from more than 60 sites on 6 continents. The consortium includes most international leaders in Genetics and Epidemiology of PD (N Hattori, M Farrer, O Ross, EM Valente, A Elbaz, C Klein, T Gasser, K Markopoulo, etc). The GEoPD facilitates epidemiologic, clinical and genetic research in PD and provides a mechanism whereby active global site investigators may share their expertise, resources (41,988 PD patients and 41,505 controls) and reagents. More than 10 peer reviewed papers have been published based on the consortium’s work. The consortium’s mission is to promote multi-investigator research projects throughout the year. Annual Meetings since 2005 offer a valuable forum for consortium members to discuss unpublished data and ideas, highlight research questions or needs and identify global opportunities for partnership. These meetings are organized each year in a different country by one of the members; the first meeting was organized in Paris in 2005, and subsequent meetings took place in Greece, Norway, Germany, Japan, Korea, USA, Luxembourg, Canada… and in 2017, in Australia. In 2018, the French partners, Alexis Brice, Alexis Elbaz, Jean-Christophe Corvol, and Suzanne Lesage wish to host the 13th Annual Meeting, on December 13th to 14th, at the Brain and Spinal Cord Institute (ICM), Paris, France. 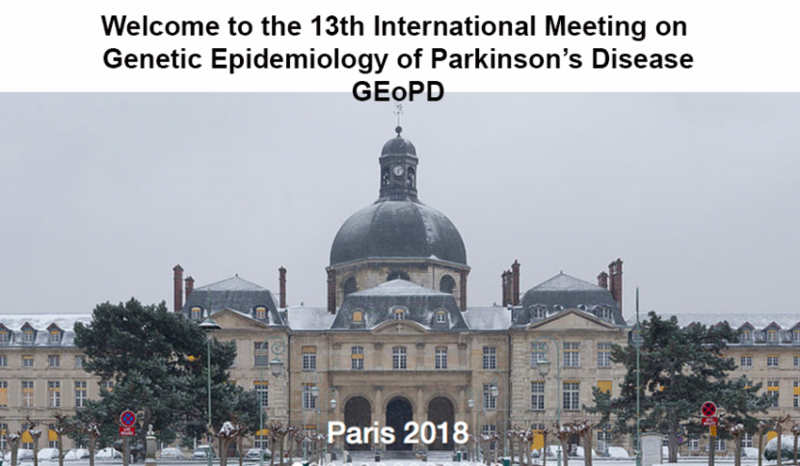 We are organizing a 2-day scientific event, including the 13th Annual Meeting of the GEoPD consortium & a satellite Parkinson’s disease symposium. The first day will be a closed meeting dedicated to about 80 GEoPD members in order to review ongoing and future projects. The second day will be a symposium to discuss hot topics in PD research open to the scientific community. More information will follow shortly regarding all aspects of the meeting.